Hello! Welcome to the Taylored Expressions May Sneak Peek Day One! 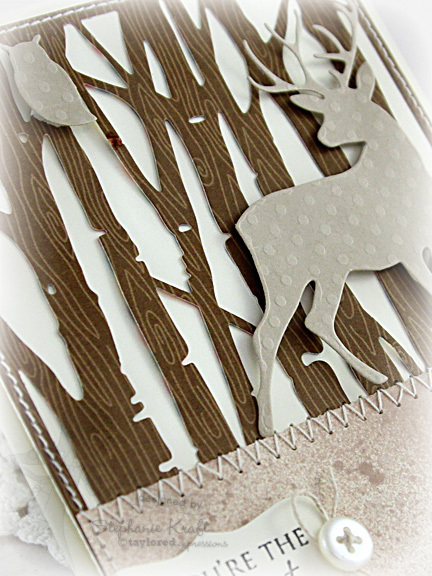 We are releasing 5 new stamp sets, 6 new dies and a 2 new cutting plates... I know you are going to love it all! We will be having a Preview Party tomorrow at 6:00 PM PST. This will be your chance to see the sets and some great giveaways. The party is always fun and fast-paced! Be sure to join along HERE! Today my project features the Birch Tree Cutting Plate and the Birch Tree Accessories. I started by cutting the entire cutting plate (A2 size) out of some patterned paper from the Doodlebug Flower Box collection. I added a strip of Choice Buttercream cardstock on the bottom after I sprayed it with some Glimmer Mist. The birch tree is so detailed and could easily stand alone, but I decided to add the buck and a friendly owl to the scene. Both were cut using the Birch Tree Accessories die. My sentiment is from a new mini set, Greetings for Him, and was stamped onto a piece from the new Band It Die. I'll be back tomorrow with more sneak peeks! Thanks so much for stopping by! Accessories: Taylored Dies: Birch Tree Cutting Plate, Birch Tree Accessories, Band It Die (Taylored Expressions); Glimmer Mist (Tattered Angels), Button, Hemp Cord, Foam tape, Thread, Sewing machine. This is beautiful, Stephanie...love the monochromatic colors and what pretty papers you used for the die cuts!!! Wow! So pretty Stephanie! Love the forest scene! That deer is gorgeous and the misted panel looks awesome! Gorgeous card! I love the addition of the glimmer mist. 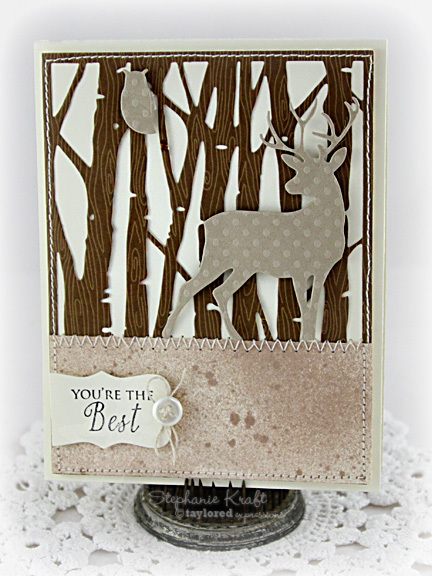 Love all the patterned paper and textures you used in this card, the monotone mixture is wonderful! I'm loving seeing all the different cards made with these new dies! Yours is beautiful, Stephanie! What an awesome masuline card! Love it, Steph!